Here’s our fantasy premier league team tips GW27 article where we analyse the teams of 10 top FPL managers. These 10 managers have not finished outside the overall rank of the top 10k in the last 3 seasons. Considering how variable the last 3 years have been this is remarkable consistency and shows an ability to adapt strategy in different seasons. It also gives you a view other than my own on strategy and player selection. The average score of the managers in GW26 was 64 taking into account point deductions for extra transfers. That’s compared to the game average of 57. That’s 7 points and 12% above the game average score. High score of the 10 was 79. The low score was 44. 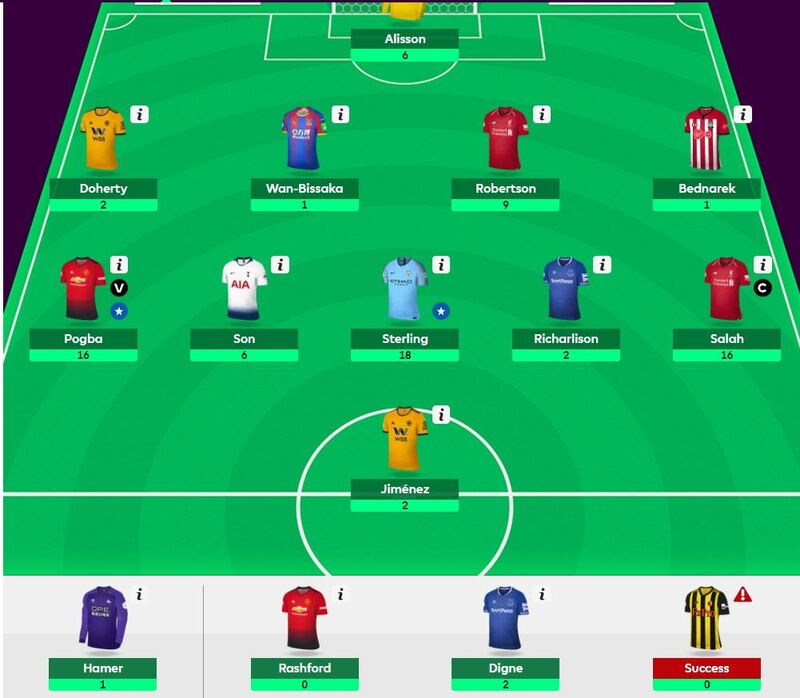 Another big spread of 55 even for an slightly above average scoring gameweek. The average overall rank of the top 10 FPL managers is 41k a worsening of rank from last week of 6k. The best overall rank is now around the top 500 and the lowest 146k. You can see my score and rank in the early FFGeek team article which I’ll do today (Tuesday). The top 10k captain choice (from the excellent free site FPL discovery) was 89% Salah and 2% Aubameyang. The FFGeek poll this time was very different to the top 10k. However the late illness of Aubameyang would have meant a change from how people voted I imagine. 2 have used their triple captain chip. 3 managers took a 4 point deduction for an extra transfer. 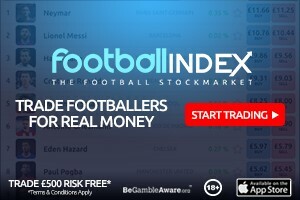 The top 10k average score was 70 compared to the 10 top managers average of 64. Richarlison is owned by 8/10 FPL managers but only 48% of the top 10k. I can forsee a situation where he is sold heavily for the blank he has in GW27 although that may depend on the 5th round results. So the 10 manager template is very similar to the top 10k one. Richarlison (owned by 8 of the 10 FPL managers) but with a blank in GW27 and 1 return in the last 8 games likely to be sold en masse. Here’s the highest scorer of the round at 79. I would also say he is probably one of the more radical of the managers. His rank is 28k and his TV is £105.0m. His transfer this week was Son HM in Bernardo Silva out. Even though I have called him one of the more radical players as you can see he has all the essential players I mention above. He only has 3 bench players rather than 4 though. The 3 being Hamer, Success and Bednarek. That plus the 8 essentials leaves him with 4 differentials. Alisson (double Liverpool defence), Sterling, Jimenez and Digne. In a captain neutral week his differentials were the key. Sterling plus the double Liverpool defence. He is placed ok for the blank week of GW27 3 players with blanks plus success. 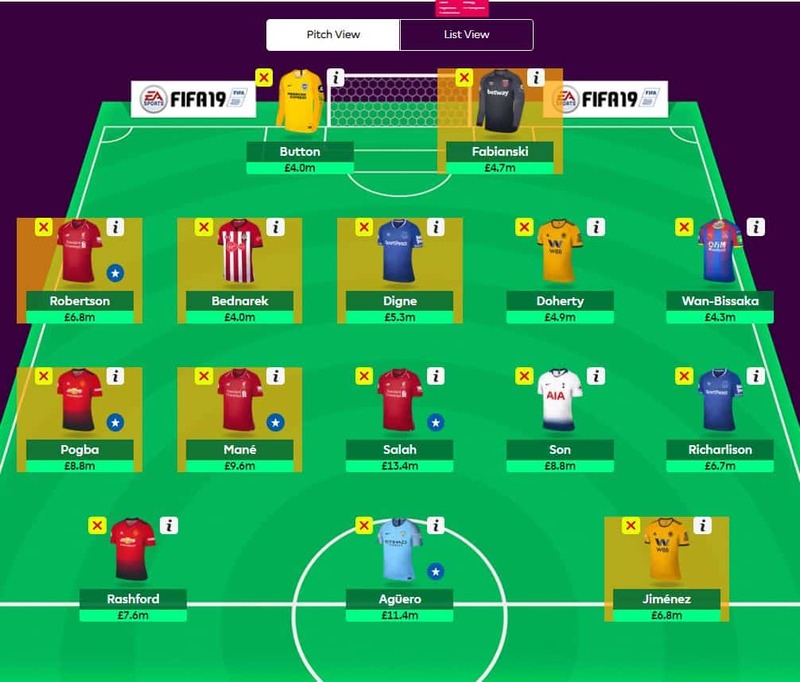 As for the blank GW31, he only has 3 players with guaranteed fixtures in GW31 and GW33 he is possibly looking to have an alternate strategy rather than work to a full team by transfers. Where did it all go wrong for Chelsea this season? Cool article, you suggest that Richarlison, owned by 8 of the ten will be sold en masse. I’m in the same boat and Ima sell before his price drops tonight as it could drop twice before deadline. I might go for Maddison. Again. Let’s hope its not another disaster like last time I bought him. I cant go for Maddison…. absolutely no form, altho the fixtures lately have been very tough and now they get considerably easier so maybe worth a punt. I understand that view. Its not an easy transfer. A West Ham option would have been my first choice but the Arnautovic move seems to have caused problems there. I don’t love any of my options. Doherty, Robertson, Digne, Wan-Bissaka, Kolasinac. Still inside 2.5k so no complaints. Auba to Aguero you should do as he is the clear captain choice next GW. Richarlison has Cardiff next so maybe worth one more GW.